I make breakfast most mornings when I don’t have to go to work. I just need a break from the grab and go type of breakfast like bagel, muffin or croissant and coffee. We’re both home today so it’s a good day to have breakfast in the garden while enjoying bird songs and flowers. Coffee was already made. What should I make for breakfast then? 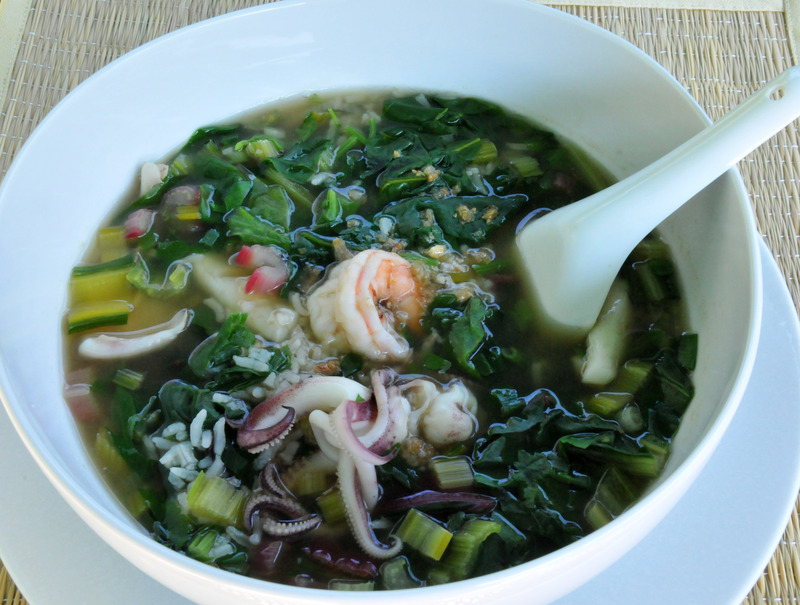 After surveying the refrigerator and vegetable garden, I came up with Seafood Rice Soup. And, it’s very easy to make. Jasmine Rice. We have left over rice from a few days ago in the fridge. This old rice makes it easier to cook the soup because I don’t have to take time boiling rice. Vegetable or chicken soup base. Your preferred seafood, fish (Salmon or Red Snapper are good for this), shrimp or squid. We happened to have fresh squid and shrimp that need to be used. Vegetables like Spinach, Swiss chard, Celery, Bok Choi, and Scallion (in small quantity). 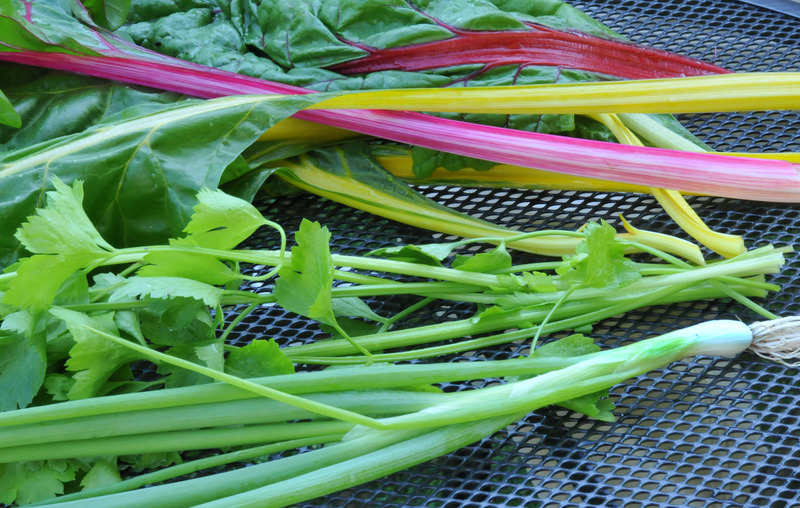 I cut a variety of Swiss Chard, Chinese celery and pulled one Scallion from the garden. How to cook: The whole process should take less than half an hour. If you have left over rice, start cleaning your seafood. If not, cook Jasmine rice in a pot with a lot of water and soup base. Once the water starts to boil, turn the heat down. Let the rice cook slowly while you clean the seafood and vegetables. Put prepared seafood in a bowl then sprinkle white pepper, garlic powder and soy sauce in. Mix them well with seafood and set it aside for now. Check on the slowly cooking rice to see if the grains have started to puff up. It’s a matter of timing at this point. You don’t want the rice getting too mushy by over-cooking it. If you are using left over rice, start boiling water with the soup base in it before you clean the vegetables to save some time. Once the water starts to boil, put the rice in and break the clumps of rice stuck together. Clean the vegetables and cut them into pieces. Separate the stems from the leaves. When you’re done with the vegetables, turn the heat up under the rice. Add the marinated seafood to it once the soup is boiling. Add the cut stems in as well. Add the leafy part of the vegetables when the liquid starts to bubble. Stir well. When the liquid bubbles up again, taste the soup. Add more soy sauce to taste. Sprinkle fried garlic on top of the soup after you put it in the bowl. This is optional but really does add a good taste. 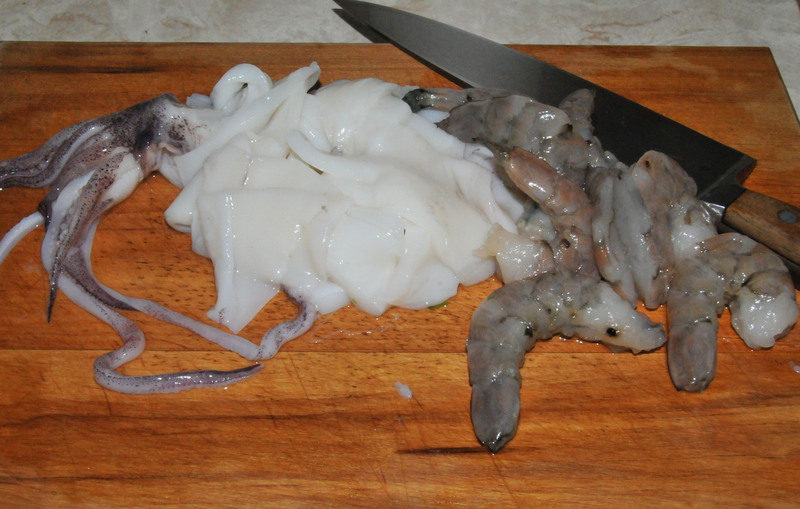 Squid (cut into pieces) and shrimp (shelled and de-vained). End product- a bowl of healthy seafood rice soup. Use all part of the leaves. Cut a stem into smaller chunks than the leaf, it’s easier and takes less time to cook. Put stems in first so they cook a couple of seconds longer than the leaves. That will help to soften them up. Don’t blanch the veggies and dump the liquid. The nutrients will be gone with the liquid if you throw it away. Don’t cook squid or shrimp too long or they turn rubbery. Don’t stir the fish too much. Salmon and Red Snapper will fall apart easily. Keep the home made soup base, either vegetable or chicken, in the fridge. It’s healthier to make your own. When you need food to fill your hunger fast, you can always add vegetables, tofu, rice or pasta to it. It will take as much time to make as to boil water. Crush black pepper into it if you like too. Lovingly prepared breakfast in the garden–what a nice ritual. The garden is our sanctuary. We think the food tastes better eating outside.